Trailer boat cruising and fishing through the ancient and revered Kimberley Coast, WA is one of the last great small craft challenges. It can involve short distances around the edges, or long, long voyages of up to 4,000 kilometres running the Coast from Darwin NT to Derby, WA. 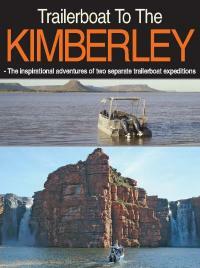 And even further if time, equipment and logistics allow the adventurer to even partially explore the indirect areas of the Kimberley. In 2008, Clint Earnshaw completed the Wyndham to Broome passage with two mates in three boats and a heap of willing youngsters. Then in 2012, Dennis and Joan Fitszimmons completed the longer run from Darwin to Derby in their 6.0m Ocean Craft. We have compiled these two exceptional reports into one definitive, 108 page PDF publication, now so easily read and enjoyed with our new production protocols on a computer, laptop tablet or smartphone.